SEOUL, Nov. 6 (Yonhap) -- The Koreas and the U.S.-led U.N. Command will hold talks Tuesday over a set of issues related to the disarmament of the Joint Security Area (JSA) in the Demilitarized Zone, Seoul's defense ministry said. The third round of the trilateral talks is set to begin at 10 a.m. at the Freedom House, a South Korea-controlled building in the border truce village of Panmunjom. 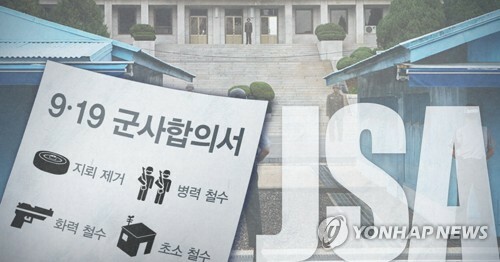 "At the meeting this time, (the three) will mutually confirm and evaluate the results of the work to verify (the disarmament of) the JSA that took place on Oct. 26 and 27," the ministry said in a press release. The three sides will also discuss ways for the Koreas to conduct a joint patrol in the JSA, readjustment of surveillance equipment and free movement of visitors to the area. The South and the North will be represented by Army Col. Cho Yong-geun and Army Col. Om Chang-nam, respectively. The UNC's delegation is to be headed by Army Col. Burke Hamilton. The Koreas agreed to disarm the JSA under the military agreement their countries' defense chiefs signed during the third summit between President Moon Jae-in and the North's leader Kim Jong-un in Pyongyang in September. The UNC oversees activities inside the DMZ.